I woke up this morning to wet sidewalks and drizzle in the air. It seems winter has decided to show up in Southern California after all, at least for a few days anyway. As much as I have been complaining about our lack of cool weather, I'm not at all sure I am loving it as I crawl out bed and reach for my warm, fuzzy robe in the morning. decorate the hutch and freshen up the centerpiece for each holiday. I gathered everything red, pink and white, put it all on the dining room table and came up with a quite a few pretty things that I think will do just fine. Before I set it out I gave the whole dining room a good cleaning. I like to put my seasonal decor out in a clean room because I find it is so hard to clean around all that extra stuff around. Don't you agree? This will be the first Valentines Day in a long time (for as long as I can remember, actually) that my husband and I will be home alone so I think I am going to surprise him with a candlelit dinner when he gets home from work. I haven't decided on the menu but my mind is already swirling with ideas for the table setting. No surprise there! I am still only midway through the purge and re-organization of my craft room so that is most definitely on my agenda for today. What about you? Anything fun planned for the weekend? If you'd like to see what I gathered for my Valentines Day decorating and where it came from, here is the link to my YouTube channel. There are a lot of fun and informative videos over there and I'd love to have you subscribe so you don't miss a thing. I'm joining Sunny Simple Life for the Saturday link party. I need to get busy and try to accomplish half as much as you do. I have no "pep in my step" right now though. Maybe it is because of leaving family and coming home to an empty house and lots of snow. Maybe it's because Hubby has been really sick with some sort of virus all week and I'm just waiting for my turn. I don't know, but I'm enjoying sitting in my chair, crocheting and watching utube! And I'm actually several days ahead in my Bible reading so that's good too. No time wasted when you're reading your Bible. :-) I hope you have a lovely Saturday Patty. We have no big plans this week-end. Tomorrow is Church day. I volunteer on Sunday afternoon where my mom lives. The ladies play Bunco and I bring the prizes and keep score. You sure wouldn't like to live where I live. There are so many rainy, dreary days that it is hard to get motivated. But today I have to get my mojo going. Lots and lots of things to do around here. Your hutch looks very pretty. I still have my Christmas dishes in my China closet. UGH! Have a good day, Miss Patty. That all looks so cute! 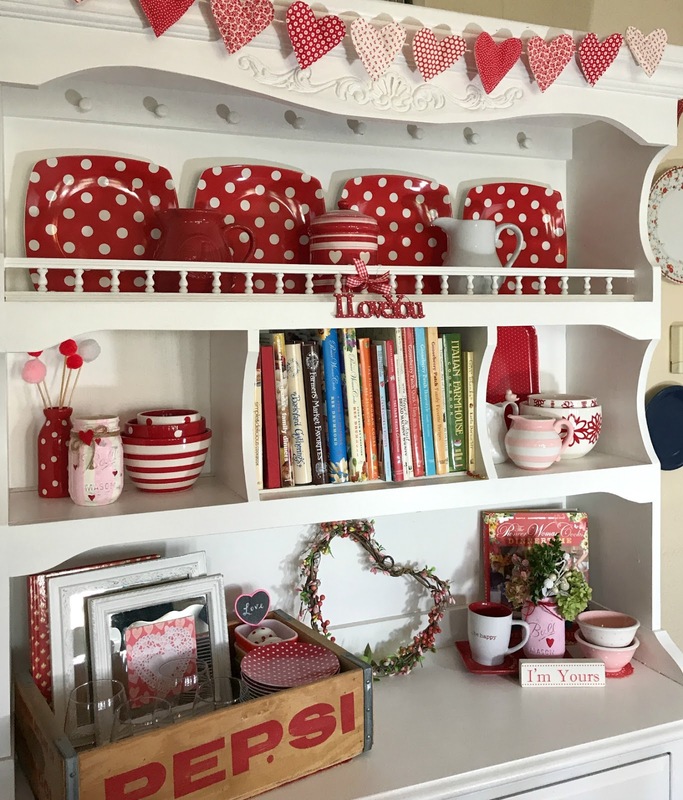 I don't typically decorate for any holiday other than Christmas but I do love the look of all that red, pink and white!